This paragraph refers to some of the rules that one should follow when bending slab rebars. These rules apply to both one-way and two-way slabs, with usual lengths and commonly ap-plied loads and only when the reinforcement detailing is not provided by another more accurate way. • In one-way slabs, the length l is equal to the distance between the two edges upon which the slabs are supported. 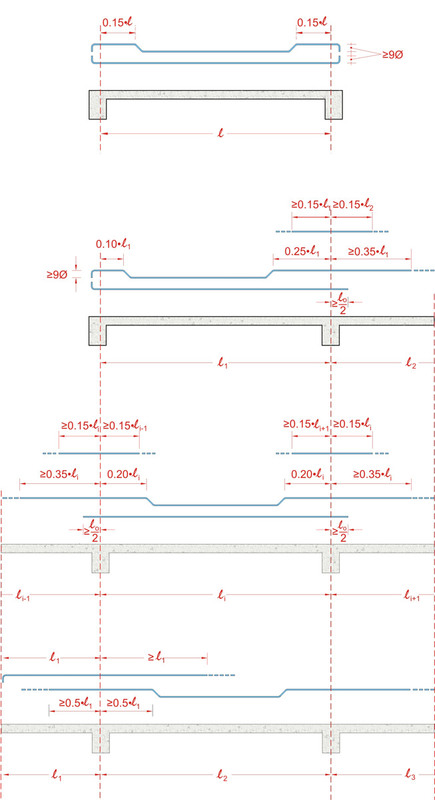 • In two-way slabs, the length l is regarded equal to the smaller dimension of the slab. • In cantilever slabs, the length l equals the distance between the support and the opposite free edge of the slab. • When a slab’s support is considered fixed, the previous corresponding rules apply. • When the lower rebars are being bent in order to provide support reinforcement, the straight created upper horizontal part must be extended by the anchorage length. • The anchorage length of the rebar (dashed line) is directly proportional to the diameter Ø and the concrete strength class and reversely proportional to the steel class. In usual cases the anchorage length is in the order of 350 mm. The use of industrial wire mesh is 30% more favorable for the anchorage length. • Bending the rebar at 90° or 135° in the edges of pin supports is positive for the proper be-havior of slabs. However, as a rule, it is not necessary especially in high concrete grades. • If the formwork drawings contain specific dimensions of the reinforcement bars detailing then these predominate over the above mentioned empirical rules.